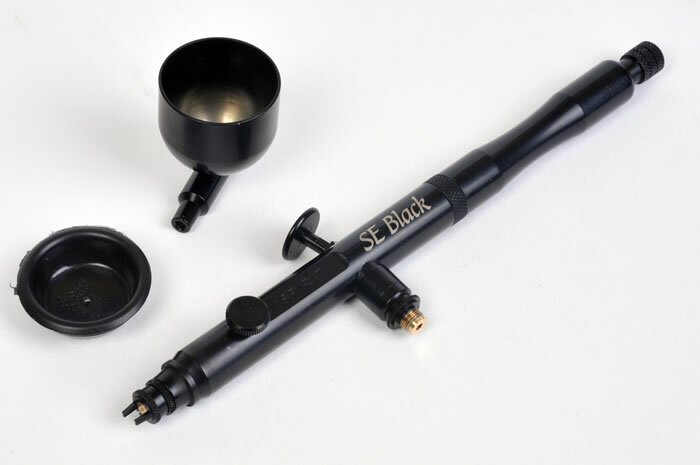 Bottom Siphon Feed R3-R Rage – Fine Nozzle. Extreme Set R123C - all three brushes with 1oz. side feed jar and ¾ oz. 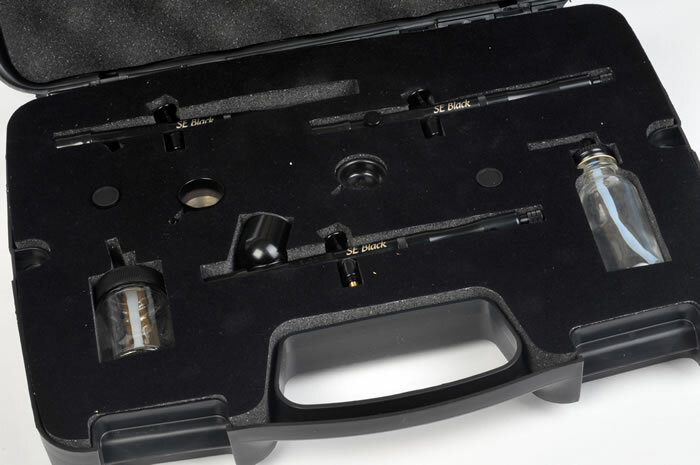 siphon bottom feed glass jars and Iwata hose adapters in plastic carrying case. Advantages: Well made airbrushes that are easy to use. Can be used to spray acrylics, lacquer and enamel paints. Disadvantages: Personal issue regarding the size of the paint cup on gravity feed airbrush. Conclusion: If you are using a single action airbrush and want to go to a double action, the Badger Renegade, particularly the gravity feed Velocity model, should be at the top of the list for your consideration. First, in the interest of full disclosure, I must reveal some possible biases. I have been using a Badger Sotar 20/20 airbrush since I picked one up at the IPMS/USA Nats in Chicago way back in 2001. It was my first good experience with a double action airbrush, after having used a single action Paasche H for about 15 years. I did try one other brand of double action airbrush (which shall go nameless), and quickly went back to the Passche H, until I found the Sotar. It was expensive, but worth every penny and I have been using it ever since then. The other bias is that two of my kids went to University of Wisconsin, so that makes them Badgers. Now that is out of the way, I am quite pleased that Badger has released this new line of quality mid-priced airbrushes (in the MSRP $150 range, and which may be bought for much less). While the Badger website promotional information indicates that these new airbrushes are for the “… the proven elite artist,” they are dead wrong. These airbrushes are clearly for the modeler, of any skill level, who wants a good quality, double action airbrush, at a reasonable price, and who wants to paint his or her own Italian smoke ring camouflage. 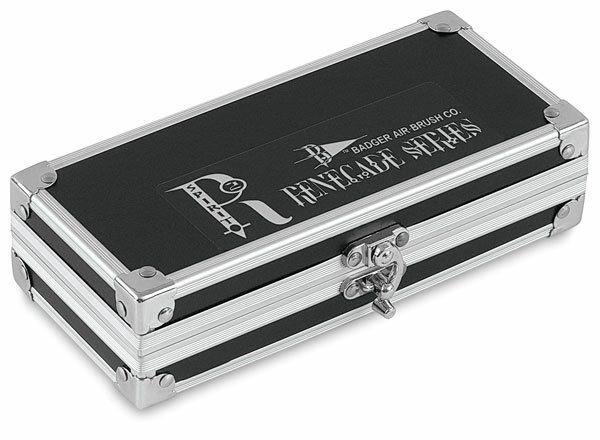 All three airbrushes in the Renegade series are dual action, internal mix airbrushes. 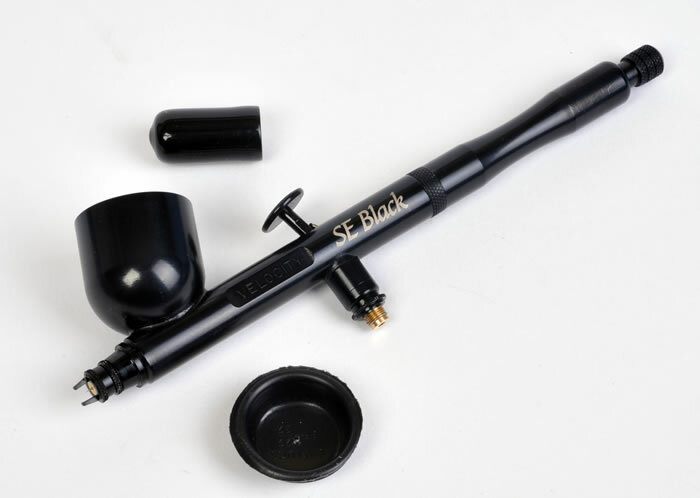 This means the trigger controls both the airflow (pushing down) and the amount of paint (pulling back) and the paint and air come together inside the body of the brush. 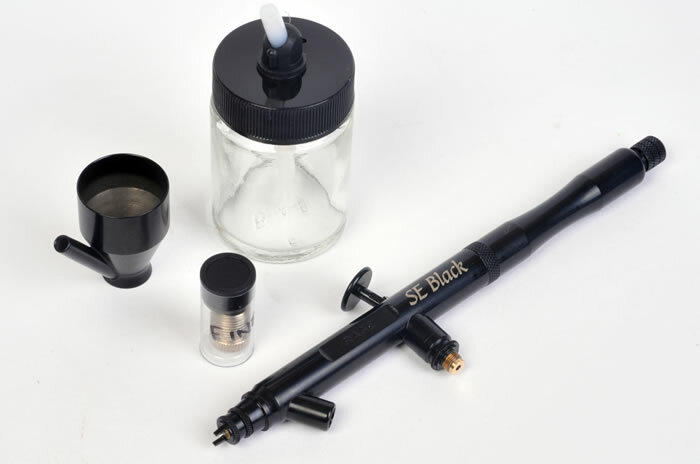 All the airbrushes can become, in effect, a single action airbrush as they have a stop set trigger control. At the end of a brush is a knob that can be turned to set how far back the trigger will travel, which determines the amount of paint that enters into the brush. While it does not have the increment marks of its much more expensive brother, the Sotar 20/20, it is quite easy and convenient to use. The Renegade comes in three different paint delivery systems and two different paint tip / needle sizes. The first is the gravity feed Velocity with the “ultra-fine” needle. In this model the paint cup is on top and an integral part of the body of the airbrush. With the gravity feed, the amount of required air pressure is less than with other feed systems, as the paint does not need to be drawn into the body. The second style is the Spirit with side feed and ultra fine tip. Here the paint is held in a cup that can be attached to the right or left side of the brush. The paint flows from the cup, through a small “pipe’ and into the body of the brush. This method allows the paint cup to be rotated from horizontal to vertical so that the brush can be held vertically without the paint spilling out. The third style is the Rage with bottom feed, or siphon feed, in a fine tip. For this model the paint cup is mounted under the brush and the paint is drawn up into the body of the brush as a result of air pressure differential resulting from the airflow. The bottom feed allows the user to switch between colors when more than one color cup are used. The paint will not leak from the siphon feed paint cup when sitting on the workbench. For most modelers, I believe the gravity feed Velocity would be the most popular. As far as I am concerned, it is also the easiest to clean, as there is no connecting tube to worry about cleaning out. I found the Renegade Velocity gravity feed to be quite easy to clean out. Given what appears to me to be a greater angle of the paint cup to the rear in relation to the body of the airbrush than my Sotar, it seems there was less “paint creep” up the needle into the body. I believe the paint cup on the gravity feed, and the side feed also, is about ¼ ounce. This is larger than the 1/12 ounce on my Sotar. One issue I found on larger cup gravity feed brushes is that the larger cup makes the brush a little more unbalanced and, if not held tightly, may slip over to the side. I found this to be an issue with the Paasche Talon, which has a paint cup that is a bit taller than the Rengade. Perhaps I am just use to the Sotar. On the Renegade, I find this issue to be less than on the Talon; the Renegade seems more balanced in my hand. As for the paint tip / needle size, on the gravity and side feed, it is “ultra fine” at .21mm. This falls between the Sotar’s fine .19mm and medium .25mm, which is what I have been using. This produces a linear airflow angle of 6°. The bottom feed is fine at .33mm, which is larger than the Sotar large of .31mm and has a linear airflow angle of 6.5°. While .5° degrees may not seem like much, in use it is quite a big difference. While being able to quickly achieve fine lines with the fine tip, the fine tip produced distinctly soft-pencil thick lines. On the other hand, if you want to cover a large area, using the ultra fine tip could more of an issue. Of course, the paint cups do hold quite a bit for extended use. But, in situations where I do need large area coverage, I’ll resort to my old Paasche. As for construction, all the airbrushes are quite substantial. The body is black electroplated brass. The needle is chromed metal, but does not appear to be as ridged as the needle used in the much more expensive Sotar. Given how fine they are, care should always we taken in handling the needle while cleaning. Care should also be taken when re-inserting the needle in the body, as the point could, and most likely would, be damaged if pushed against the trigger. One slight inconvenience of the Renegade compared to the Sotar is that the rear of the body must be unscrewed and removed, as is also the case with the Paasche Talon, before the needle can be removed. In the Sotar, the needle passes through the trigger stop adjustment knob. Of course it is the ease and quality of use that is can determine whether one likes a given airbrush or not. This is where individual likes and practices come in to play. For example we have all heard of some strange modelers who hold the airbrush in their fist and control the trigger with their thumb, rather than the index finger. Odd indeed. But, holding the Renegade in the “normal” manner, similar to using a pencil, and using my index finger, I found the control of both air and paint flow to be quite excellent. Control seemed quite easy. As for paint thinning, that becomes an issue with each bottle you use. No two seem to be the same in terms of their viscosity. Badger recommends a mixture of paint and thinner such that the mixture is like 2% milk. It is all a matter of trial and error and need to adjust as one goes along. I took a fresh bottle of Tamiya acrylic and without thinning was able to spry it though the ultra fine tip brush without any problems. With a thinned paint in an ultra fine tipped airbrush, I was able to do Italian style smoke rings and make other fine lines and fine mottle. 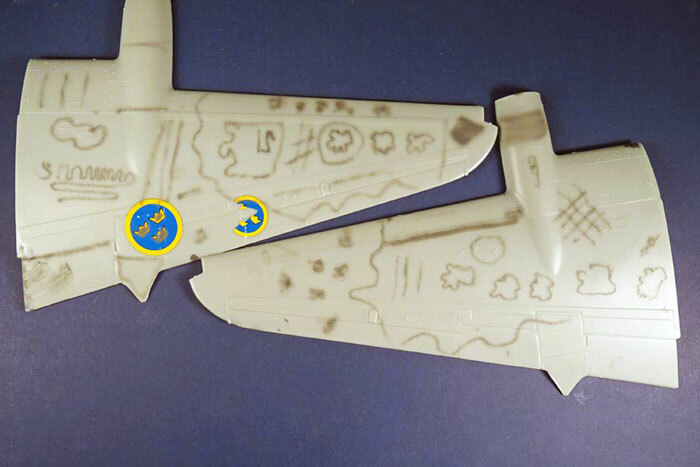 My random efforts can be seen on the wings of an Airfix 1/48 Mosquito. Finally, there is the issue of air pressure. Considering my gauge is not as precise as it could be or should be, I estimate that with the gravity and side feed, I’m using about 12 to 15 psi. With the bottom, siphon feed, it is a little more. As with thinning it is about your compressor and gauge. Airbrushes are much like cars or colas. Once you choose one you like, you are unlikely to switch to another brand, or believe that another brand could be better. But if you are using a single action airbrush and want to go to a double action, the Badger Renegade, particularly the gravity feed Velocity model, should be at the top of the list for your consideration.